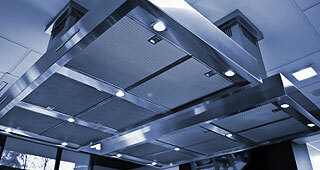 If you have a commercial kitchen then your risk assessment should include regular ductwork cleaning to satisfy the Regulatory Reform (Fire Safety) Order 2005. The majority of kitchen fires start within the ductwork, so regular cleaning is an integral part of your risk reduction strategy. We also clean air ductwork in accordance to the requirements of the Workplace (Health, Safety and Welfare) Regulations 1992. These regulations require regular air ductwork cleaning and maintenance for all mechanical air supply and extract systems. We are corporate members of the B&ES, CHAS, Construction Line & BICSc and get externally audited for our health and safety and industry compliance. To ensure quality of service our staff are thoroughly trained, helping to guarantee our extraction system cleaning meets with your requirements. Can you be sure you have minimised the risk? 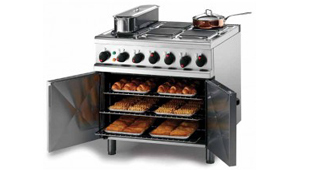 As part of the UK's largest catering equipment buying consortium we purchase at the best rates and by regularly checking our advertised prices offer consistent outstanding value. Additional cost savings are made by providing a number of catering related services, allowing us to spread overheads between divisions and pass the savings to our customers. With over 25 years in the catering industry we are well versed with the commercial caterer's needs and we are focused on customer requirements whilst maintaining our core values. Our long standing, dedicated team offer a friendly professional service and you can always get hold of a knowledgeable member of staff. The Food Safety (General Food Hygiene) Regulations 1995, states that if you can open windows and doors to the outside environment they must be fitted with insect-proof fly screens. Our fitters tailor make, made to measure fly screens or PVC curtains in a mobile workshops at your premises. Our insect screens are designed and developed to withstand the demands of commercial use however the fly screens are also aesthetically pleasing and equally suited to a domestic environment. All our fly screens and PVC curtains satisfy the relevant legislation and our fly screen doors comply with fire regulations. 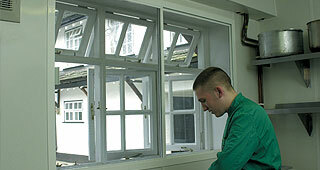 We also supply DIY fly screens, mesh curtains, chain link curtains, PVC rolls and component parts. Have you done everything possible to minimise the risk from airborne contamination?